The SS Selma, a World War I reinforced concrete tanker scuttled decades ago off the coast of Galveston, Texas, and visible above the water line, is no longer just a local curiosity. Since 1992, besides recognition with a Texas Historical Commission's Official Texas Historical Marker, she has been designated as a State Archeological Landmark by the Texas Antiquities Committee, as the Official Flagship of the Texas "Army", and is listed on the National Register of Historic Places. In addition , the SS Selma rests in a significant site in Galveston Bay, the bay near the "marine battleground" for part of the Civil War's Battle of Galveston in 1863. None of these honors in the past few years would have occurred had it not been for the tireless efforts of a former city editor of the Galveston Daily News and retired copy editor of the Houston Chronicle, A. Pat Daniels, of Houston, who purchased the Selma in 1992. He has exhibited an uncommon love for the old girl, so much that he throws a birthday party for her every year with much fanfare, inviting many of the local Texas luminaries and a few outsiders, myself included. The Selma, a 7500 ton reinforced concrete tanker built in Mobile, Alabama, was launched on June 28, 1919. 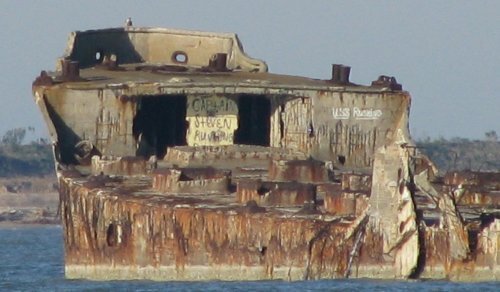 She was one of several concrete ships conceived and designed during World War 1. Construction was not completed until the war ended. She had a length 420 ft., a beam of 54 ft. and a draft with full cargo of 26 ft.. Her loaded displacement was 13,000 tons. This vessel marked the first use of shale aggregate expanded in rotary kilns for lightweight structural concrete. Steel was in short supply because of the war efforts and concrete was then proposed as a viable alternative material for use in ship building. Feasibility studies by marine engineers indicated that a reinforced concrete ship would be practical if the concrete had a compressive strength of 5000 psi and weighted no more than 110 lb\ft.. As a matter of fact, the Selma's average compressive strength at 28 days was 5591 psi and the average modulus of elasticity was 3,306,000 psi, well beyond all expectations. The hull of reinforced expanded shale lightweight concrete was 5" thick at the bottom, tapering to 4" on the sides. It required 2600 yds. of concrete reinforced with 1500 tons of smooth reinforcing bars. Expanded shale aggregaate was supplied in two graduations, fine and coarse. Diatomaceous earth was also used in the concrete. To obtain proper placement of concrete in the thin hull and throughout the heavy mats of reinforcing steel the concrete mixture was quite fluid. Internal vibration was also used to improve consolidation. The Selma served several ports in the Gulf of Mexico quite successfully. Unfortunately she ran aground on the South jetty at Tampico, Mexico on May 11, 1920, creating a sizeable crack about 60 ft. long in her hull. She was towed into Galveston for repairs. Although the damage was repairable, the dry-dock crew lacked the knowledge and had no experience repairing a hull of such material. With no guarantee of proper restoration, the U.S. Government's Emergency Fleet Corporation decided not to gamble. A channel 1,500 ft. long and 25 ft. deep was dug to a point just off Galveston near Pelican Island's eastern shoreline. After being stripped of all valuable equipment, on March 9, 1922 she was towed out to her final berth, and laid to rest. This left the hull partly submerged, although awash when seas were rough. The Selma has over the years been object of many failed plans to convert her for use as a fishing pier, pleasure resort and oyster farm. Long a source of curiosity and local legend, she remains important to concrete and academic experts as an object of study of her construction and durability following decades of exposure to marine conditions. The Selma is still quite visible today from the historic marker on Pelican Island and has become an interesting artifact to be viewed by the locals and visitor tourists alike. Although she will never sail again, she has been proudly resurrected by Daniels and other proud Texans who believe she lives on in spirit.